Learn how to design course content to work as clicker presentations. You can use any program (e.g., PowerPoint, Keynote, Google Docs, Word, Acrobat, etc.) to present a question to the class. Or, you may choose to verbally present a question. Simply state the question and answers choices. 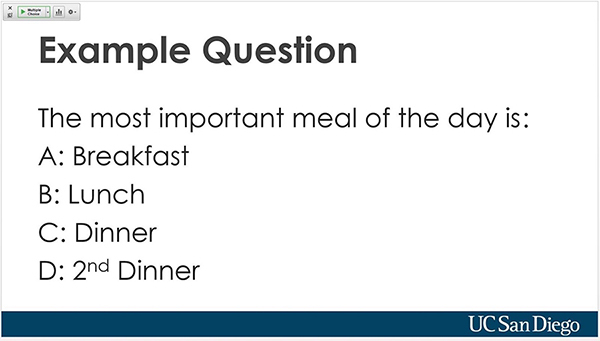 Here is an example of a multiple choice iClicker question slide. 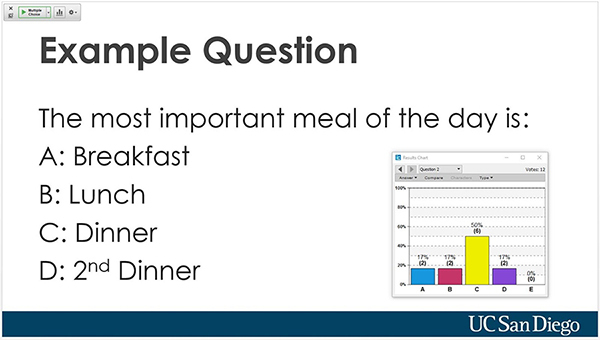 If you want to show polling results during class, it is a good idea to leave some space on the slide. The original iClicker and iClicker+ remotes can only answer multiple choice questions. If your students all have iClicker 2 remotes then you have 3 options for polling questions. Multiple choice is the most common question type on campus. We have found that numeric and short answers are not as easy for students to respond to and may cause confusion during the polling. For more info, contact us at clickers@ucsd.edu.